The Clayton Hotel in Sligo have been announced as the new sponsors of the Sligo senior hurling team. The announcement of the partnership was made last week following Sligo’s recent appearance in the National Hurling League Division 3B final. The reigning Lory Meagher Cup champions, who will begin their championship campaign in the Christy Ring Cup in May, will be sponsored by the Clayton for the next three years. The Clayton hosted a launch event to mark the new sponsorship arrangement this week on their picturesque grounds overlooking Benbulben. As part of the sponsorship, Sligo GAA will have the use of the award-winning Clayton Hotel facilities, including the Club Vitae gym and 20m pool, as well as the use of conference and meeting rooms and other facilities available at the hotel. Sligo County Board treasurer Peter Greene added that Sligo GAA are very appreciative of the sponsorship provided by the Clayton and expressed his hope that the players, management, and supporters would get an early opportunity to celebrate their recent successes in the hotel. Meanwhile, Sligo GAA have also renewed their sponsorship arrangement with the Connolly Motor Group. 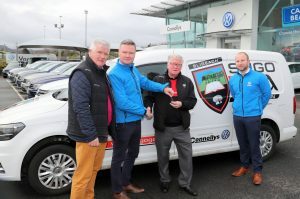 Connolly’s will once again deliver a critical part of the support function for the Sligo senior footballers for the 2019 season by providing the team kit van, decked out in the team colours. Connolly’s association with the Sligo senior football team has been established for a number of years, a fact County Board treasurer Peter Greene acknowledged at the announcement this week. He also noted that “this sponsorship is a very practical way to support the senior team in the coming season. The link between Sligo GAA and Connolly’s goes even deeper, with sales executive Eoin McHugh a defender for the county’s footballers. Sligo’s faithful kit-man John McPartland took possession of the keys of the new vehicle from Stephen Kearns (commercial vehicle manager) at a handover ceremony at the Connolly Motor Group headquarters in Sligo.